I started this series of interviews in order to get a better understanding of the people who shape education in Tennessee. In order to get a robust picture, it is important to talk with people with disparate views from my own. 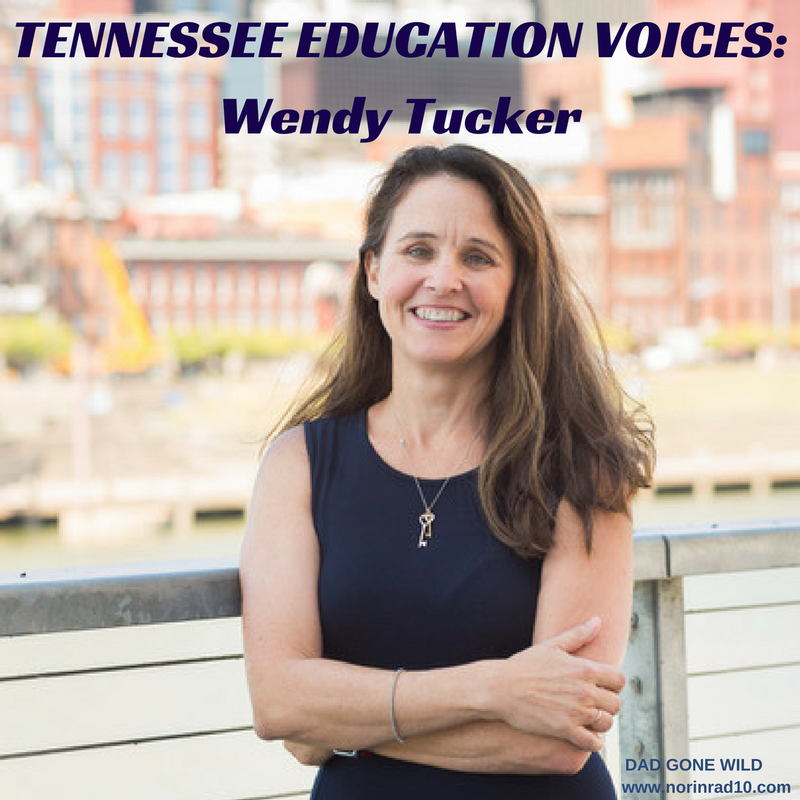 Wendy Tucker is a parent, advocate, adviser to former Nashville Mayor Karl Dean, and current member of the Tennessee State Board of Education. Over the years, we’ve often found ourselves on opposite sides of education policy debates, and it hasn’t always been civil. A couple weeks ago, Wendy said enough was enough and how about we sit down and have a coffee. I agreed, and the result was an interesting conversation. I’m not sure that the conversation led to a change in belief for either of us, but we both gained a greater understanding of each other’s motivations, experiences, and intentions on which those beliefs were forged. Hopefully we also found out we were both a little more multi-dimensional then previously thought. Dad Gone Wild: I’m always interested in people’s stories and how they came to be involved in public education. So how about a little bit of your history and how did you arrive where you are now? You’re not from Tennessee, are you? Wendy Tucker: I’m not. I am from a small south Louisiana town, Hammond, Louisiana. Probably never heard of it. I am the youngest of four, raised by a divorced single mother. And I am the first in my family to ever graduate from college. That happened mainly as a result of a very persistent parent and two amazing teachers who didn’t take no for an answer because where I come from at that time, college in my hometown wasn’t really necessarily an automatic part of the equation. I was able to get a scholarship and go to Tulane, where I went to law school as well. After that, I came to Nashville and became a public defender. It was impossible to miss the connection between our young clients and the fact that they had given up on education. The biggest influence on me, though, has been my daughter. I have a soon-to-be 15-year-old daughter with profound special needs, and navigating the education process with her showed me how complex it is for parents. That insight led me to start helping parents, pro bono, handle school issues for their kids with disabilities, which led to co-creating a non-profit to do that work. That led me to co-chair then-Mayor Dean’s task force on special education with Elise McMillan from Peabody and the Kennedy Center. After that, Mayor Dean hired me during his second term to be his education adviser, and I joked with him that he hired me so I’d stop suing his city. DGW: Probably not a bad idea. WT: It worked. But that’s how I got into the actual education policy world. DGW: One of the reason’s that I started this interview series is because I’m fascinated with people’s stories and I feel that we are too quick to pigeonhole people before we know those stories. Which gets in the way of real discussion. WT: Yup. I think it needs to be said, because I am clearly pegged as a charter zealot by some, that I never stepped into a charter school before working for Mayor Dean. I didn’t know what a charter school was, not unlike a lot of Nashvillians who still don’t have a clear understanding of charter schools. I first visited Nashville Prep when they were at TSU’s downtown campus in my role as Mayor Dean’s adviser, and I was blown away by the level of engagement in the classrooms and by the high expectations for the kids. Many of those kids were kids in very different circumstances than mine. I’m not comparing my small town upbringing to inner city high poverty upbringing. But in some ways, I connected with them because they were kids people didn’t think would go to college and were now in a building with people who thought they would go to college. That’s the role my high school English teacher Grace Milton served for me and so it resonated. I saw a building full of people like her, and I became a believer. I am still a believer in great charter schools. I’m also a believer in great district schools. I just think that the people matter a lot more than the structure of the governance of the building. DGW: And I’m still a big believer in that the delivery system matters. That’s what schools are essentially, delivery systems for education. I believe schools should be charged with creating great citizens, as well as great readers and mathematicians. Public schools, in my estimation, are a pillar of a democratic society. That said, I will concede that after having my kids in a high needs school for several years, I can understand why parents consider charter schools. And I love my kids’ school. I think their school is going to make my kids better people in the long run, and I think that the level of instruction they receive is excellent. But there are trade-offs, and it’s not easy. But the only way that school gets better is if everybody enrolls. If families are making other choices, I don’t believe you can expect expect poor families to stay in the school and fight for the system while other people are exploring other avenues for their children. WT: Yeah. And I see that perspective. The perspective I see as well, and the one that is part of my DNA, is that every parent wants better for their kid no matter how wonderful your parents’ experiences are or how bad. They all want what’s better for their kid. And I’ll give an example: my children. When my daughter was about to start kindergarten, we were in Davidson County. I am a bleed blue democrat. I wanted to stay in Davidson County, but my daughter has profound special needs. She has a seizure disorder. As she was growing up, we got on a first-name basis with EMTs because there was a period of time where her seizures wouldn’t stop. She has an implant in her chest to stop seizures but that doesn’t always stop it. Metro Nashville Public Schools was not going to be able to meet her needs. We moved to the most affluent area of the city to try to get her needs served. But when we visited and conducted our IEP meeting, it was clear that her specific needs wouldn’t be met. So we made the very difficult choice to move to Williamson County because we toured Williamson County schools. We found a school that could meet her needs, had a nurse all day everyday, had full inclusion in the classrooms, and had the supports necessary. By moving from East Nashville to West Nashville to Williamson County, did I abandon kids who didn’t have those choices or the the ability to move? I mean in some ways, I suppose I did because I did what was best for my child. But what I want to see is all of those families having the level of choice that I had. We as a family have resources; resources that are not available to other families. Not everybody can move to Williamson County. And so I feel passionate about the ability of parents to make that choice. I get that if a lot of parents make choices, then a school can suffer. I’m sensitive to that, but I think it’s a more complicated situation than people will admit. But what I sort of see is parents and their kids in the moment. I think of the kids who I represented as juvenile offenders and wonder what would have happened if they had found a charter school that met their needs or a special teacher in their district school. If they had just found something that kept them engaged in school, then maybe they wouldn’t be in an adult prison right now. They could be on different paths. That’s why I feel passionate about parent choice. DGW: Well, I think some of what we are talking about puts a little too much on our schools to begin with. I think we need to step back and realize that not all of it can be on our schools. Working this past year with an aftercare program and actually being in the school more, I see kids who are just faced with overwhelming obstacles before they even enter school. Society is failing them. That’s where I’ve also begun to lose a little stomach for the charter school wars. You have adults arguing about the delivery method when, at the end of the day, it doesn’t matter if they go to a charter school or a public school because they have such extensive needs that need to be met before they ever even get in the classroom. I was talking with Gary Hughes, who is principal of JT Moore Middle School, about this the other day. Even in a school considered to have low poverty, they still face these challenges. They still have children who are more focused on getting something to eat, or a safe place to sleep, than with learning to read. Somehow that has to be addressed. DGW: And again, that’s a debate we could go back and forth on forever. I am a currently little frustrated with our school board and the way they are treating charter school parents. If you go to a charter school, you are still part of Metro Nashville Public Schools. Now, if you want to argue the level of oversight those schools are given, that’s a whole different conversation. But a charter school student is still considered an MNPS student. DGW: So we should treat those parents like they’re MNPS parents. Or cut them loose. Just let them go and form their own administrative body. I think that would be a lot more honest than keeping them under a governance body that doesn’t want to acknowledge them or serve them, and that’s where we are now. WT: I agree. And I think–I mean I can’t speak for the governance body, but do I think there is a lot of support at the district level for our charters and our charter parents. There are clearly some people who don’t support them, but on a whole, the district supports our charters. In some cities, it’s different. Now that being said, there are some parents who are concerned and don’t feel like they’re treated like MNPS parents. And I think that’s sad because every parent has enough challenges without feeling like they are outcasts for a choice they made based on what they thought was in the best interest of their kid. DGW: Over the past year, I’ve had a number of conversations that have continued to resonate, and I hate to drag them into the conversation, but I’m going to anyway. In talking with Dr. Looney in Williamson County and Dr. Woodard who now works in Maury County, a common point was made that instead of arguing over charter schools, we should focus on making schools better. Make your school so good that demand for an alternative is not there. I will continue to argue that parents don’t want choice, they want quality. I think ultimately that’s the thing that frustrates me the most – we don’t spend enough time improving schools. If we were to wipe out charter schools tomorrow, what would the landscape look like? WT: Right. I agree with you on that. I think the district schools face challenges that the charters don’t face in the sense of rules around the hours in the day and the number of days they can have. Obviously more time on task is going to help, and charters are able to do that. But I also see, when I go into a great charter school here in Nashville and I walk into a classroom and spend time watching the instruction, I see really rich instruction. I see highly engaged kids. It’s the same thing I see in a great classroom in a district school. So in some ways, I think there are barriers in the district because of the hours limitations, the days limitations. There’s a lot of bureaucracy. That’s just the reality. But a lot of it comes down to the people and the talent that’s in the building and the leadership that’s in the building. DGW: The last time we talked, one of the things we talked about was money and the role that money plays in schools. Is it money or is it culture? That really got me thinking because to be honest, while schools are unquestionably underfunded, I don’t know that we are always as prudent with the money we do have as we could be. Conversely I don’t know that we’re empowering people to create a really great culture. Is it prudent to overpay management and underpay those in the trenches? WT: Yeah. There’s a lot of debate about charters supposedly having so much more money than district schools per kid. The numbers I’ve seen don’t reflect that. Charter schools have to pay for their buildings. They have to pay for their transportation. They face a lot of expenses that traditional schools don’t necessarily face. So, I would say that the great charters in Nashville have been forced to do a lot with a little. And if they can do that, I think that could be a lesson to the larger structures in Nashville that maybe if you targeted the money better we could get better results. I’m not the finance person who determines where all the money goes, and I’m not saying I have an answer, but I do think that a lot of our local charters have shown how to do really great work with less money. DGW: Part of the hindrance in this conversation is a lack of transparency across the board. I know a couple of years ago, when I asked for exactly what LEAD Academy was getting from donors, I had to make an open records request and then go through three or four levels before I could get their donor’s list. Those donations totaled 1.5 million dollars, which is something that public schools don’t have access to. DGW: Traditional public schools, I’m sorry. I’ll work on that. WT: [laughs] It’s okay. You’re not the only one. DGW: And so if we had a rubric that we could look at and see that everybody was adhering to the same rules on disclosing their finances, their enrollment processes, their discipline processes, their hours, etc. – then I think you could possibly do a little bit more collaborating. Unfortunately, because there is no clear rubric, we end up arguing back and forth with each assuming the worse about the other..
WT: I can agree with that. I will say that the charters’ financials, as far as I can tell, are much more available and transparent than the district schools’ financials. Charters have independent audits that are required by law and made available every year. Traditional schools don’t have the same requirement, so it’s a little more difficult. I don’t know that I would be able to assess if I picked any district elementary school, and wanted to see how much money they got, how much money their PTO donated and any other donors and their Pencil partner. Would I be able to actually decipher all the numbers? So I agree with you, more transparency across the board would be helpful. But what I think gets lost in this whole charters-get-millions-from-donors conversation is that they get per-pupil dollars for the kids who come to their school that they have to do everything out of, which is very different than the district, which gets the building, transportation, the economy’s scale of special ed, and then they have to, while educating kids, go out and ask for money. So, I don’t know of anything stopping a district principal from going out and trying to fundraise with philanthropy. I’m sure they could do that, but their time is probably just as hard to manage that way as a charter. And so the fact that charters are successful in doing that, I don’t think they should be dinged for it. The fact that they have to do it is where I think the conversation needs to go. I would love to see our public charter schools get facilities without having to pay for them. They’re paying rent. The rent for the ones who are in district schools now just went up. DGW: This is where things can get a little suspect. Take, for example, Rocketship Education, a national charter network, and the model that Andre Agassi has developed. They have an independent corporation that buys and develops the property, leases it to Rocketship at a reduced rate, still gets all the tax breaks, and if Rocketship fails, Agassi’s corporation walks away with a valuable piece of property acquired at a reduced rate. That may be a legal way to do things, but does it pass the smell test? I can attest to what you just said about looking at the budgets for a local school because I have spent a great deal of time looking at the district budget this year, and I’ve pulled all the Title I budgets to look for where the money is going, and to be honest with you, it might as well be written in Chinese for all I can see. I’ve had to have people explain to me that this is where you get this money, but then it’s weighted this way for this, and then this is coming from the State but then you’ve got these two Federal grants which are supposed to be used for this, but we found out that this is close enough to that to use it for that. And well, here comes the PTO money, but you don’t have a PTO so you don’t get that money. But I know you think that we get the Title I money, so you….. – I’ve had to walk away from budgets and acknowledge that I’m not a CPA and I’m never going to be able to really follow the money. Getting the information is only half the battle. Getting it in an decipherable form should be the goal. The other thing that concerns me a lot, and you touched on it, was hours. It’s a bit of a pet peeve of mine. We are so willing to use extra hours for our kids of lower economic status and our English learner kids on more direct instruction. Whereas our kids from the middle class and higher are going home to families who take them to museums, libraries, and sign them up for extracurricular activities. Like my kids, for example, they do Ju-Jitsu, ballet, and Little League baseball. We tend to forget that kids’ natural state is learning. So these activities shape them as much, or more, as any direct instruction. We as adults, look at a kid and say this third grader is reading on a seventh grade level. That’s awesome. But what did we sacrifice to get there? Did they have the opportunity to learn leadership? Did they have the opportunity to learn team work? Did they have an opportunity to learn how to deal with failure? Did they have those opportunities? Because while this kid was striving to read at a higher grade level, these other kids were out developing leadership skills and such. So all of a sudden, we’ve got these two tracks, where one kid is going to go the worker track and other kids are going to go to the management track. That concerns me a little bit. What are we using extra hours for is a conversation that needs to happen. DGW: I’ve been to LEAD Academy and I think one other. WT: Alright, but I want to bring you to a few others. They are doing longer hours, but in those hours, they’re doing chess and soccer teams and soccer clubs, and outdoor garden club, and they’re fitting all those things in. I know STEM Prep’s soccer team is pretty competitive. You’ve got world percussion at Liberty. You’ve got intramural sports. The narrative is that these kids sit at their desks all day and get instruction and it’s just not actually the reality. They do get more instruction time and they focus on time on task being very deliberate . In some schools the teachers change classrooms instead of the kids to save time, and then the kids get brain breaks and they’re doing fun things while the teachers are changing class. So, they’re just really stingy with the time they do have for academics, and the grade schools make room for the other stuff that I think is important. The reality is a lot of kids in our city are not going to get Jiu-Jitsu and ballet at home, so providing some of those enrichment opportunities and time to just be kids at school in that longer day I think is a great opportunity. DGW: That’s one of the reasons why I support the recent community schools initiative. I think it’s extremely important for kids to interact with other kids across all socio-economic levels. When we all used to go to the same public school, we interacted with kids from all different levels. But now we are becoming more segregated, which robs kids of those opportunities. For example, at Tusculum, where my kids go to school, they’re interacting with mostly lower income kids. My kids are going to Nashville ballet and playing Little League in Crieve Hall and they’re making relationships with kids from different tiers. But what about the kids who don’t have those options? I know we say “well, they’re only in first grade, those relationships don’t matter,” but if you look at our own lives, some of the most important relationships were the ones we made early in life. When these kids graduate and enter the job market, there is no radar sweeping up all the kids reading at or above grade level into a job. It’s the relationships and the social norms kids have learned that lead to opportunities. I think that the relationships get lost sometimes when we focus so much on achievement. That’s one of the places that increased focus on accountability and testing has led us. WT: I agree. I think there’s a balance. My mother – we did not have vouchers in Louisiana – but she worked herself to death to send us to Catholic school through eighth grade. I think she felt like it was the only option, and that’s back when Louisiana was battling Mississippi for 50th place when it came to education. Therefore, I was tested to death in Catholic school, and I think I turned out okay. So the whole testing question, the way I approach it with my daughter who takes tests – my older one doesn’t – is like this: it isn’t about how you do compared to anybody else. I don’t care if you miss every question; what I care about is that you give it your best shot. This is about helping your teacher figure out what things she can focus on with you. I think if we approach it that way, as parents, it’s helpful. Now, I get it that teachers are tied to it and there is some stress there. I do believe there has to be accountability for teachers, though, if teachers are ever going to be treated as the professionals they deserve to be. I haven’t seen a better accountability system proposed. I see a lot of knocking down of the accountability system, but I haven’t seen anybody come up with something that I think would work any better. DGW: Accountability is really a tough nut for me. I always end up pointing to my own experience. The teacher who inspired me was an environmental science teacher who was crass, sarcastic, wore a bad toupee, and spoke in a fake English accent. But I loved him and thrived under him, whereas other people I went to school with who had him thought he should have been run out of the teaching profession a long time ago. Any accountability policy has to be able to take the intangibles into account. His impact on my life is immeasurable. When I take my kids to a creek, we look under rocks, to look for different larvae and I can tell them what kind of fly that is and such. I think we tend to lose sight that good teaching involves a little magic. I certainly would hate to see us lose that magic. DGW: I don’t know how you strive for accountability and measure magic at the same time. WT: I think the intent of the current accountability system is for the observation piece to be that piece. So you have to have great leaders who are willing to be super honest, both on the good and the bad. That’s where relationships can make it challenging. If there’s somebody that you just really like, especially in some of the smaller towns that are in my State Board of Education district, where the first grade teacher is probably the person who taught the principal first grade and the neighbor and the assistant principal, it becomes hard. I just think if my goal at the State Board and my day job is to always try to figure out how to be student focused – what’s best for the students – because sometimes that is not what’s best for the different adults. So an observation of that teacher for your class, hopefully, the principal would have seen what an impact he was having. I don’t know. You’re going to lose people no matter what system you have, and I don’t want to lose anybody either. DGW: No, we need all hands on deck. I think one thing that gets in the way whenever we have these conversations is that we never start at the beginning: what is the purpose of public education? Is it to fuel business? Is it to make better citizens? I’ll be honest with you, for my kids, to put it bluntly, the biggest thing I care about is that they don’t grow up to be assholes. They can be C students their whole life as long as they grow up to have compassion and be decent people and a productive part of society. The quest for greatness is not primary for me. Where does that fit into the overall societal picture? WT: There are certainly parents who would disagree with you. I was told about parents who had a written plan for their child to be the valedictorian that started in his eighth grade year. They had detailed everything for that as if it was their goal for the child’s education. And then apparently that child rebelled and got a C because it wasn’t their plan, and so I think those parents are out there. For me, I want my kids to grow up to be decent human beings as well, and I think school plays a role in that. I think I should play a role in that too. But I also want my kids to be able to dream big and have the tools they need to reach those dreams and so that’s why for me what’s important is – and I know you hate this word – but like grit. WT: I know you hate that word. DGW: God, with a passion. WT: I want my kids to not give up easily. Because I think that’s what my mother taught me, watching her struggle as a single mom and just never letting the door shut. DGW: I get that, but the flip side is we’re asking the kids to have grit who are are already demonstrating more grit than we should expect from anyone Those kids don’t need grit; they need a break. WT: I’m talking about my kids. This is my personal “what I want” for my kids. I don’t want Franny to go to school and her teacher to give a lesson on grit. I’m not interested in that. I’m interested in her going to school and learning to love reading. I tell her stories how I would hide under the blanket with a flashlight and read when I was just a little bit older than her because I loved it so much. If she’s in a classroom where the teacher’s going to give her some boring text that doesn’t hold interest for her and some worksheet, and that’s the work for the day, that’s not going to get her where she needs to be. So I want that; I want to foster her love of learning. DGW: Here’s a question, where does she need to be? WT: Well since she likes to boss everyone around, and she did say that after the last election, that she guessed she would have to be the first girl president after all. I told her I hope she was the fourth [laughter]. So she needs to be somebody in charge of everybody so she can continue to boss them around [laughter]. Or, she’s going to have a miserable existence. Now, I’m joking – kind of. She needs to have experiences in her young life and there’s plenty of young life left – she’s seven – where she decides what makes her want to get up in the morning as an adult. At some point, she says, ‘I want to be an artist,’ and it changes, as you know, when you get older, but she needs to have enough experiences where she can see what makes her super excited. That’s what kids like ours have the benefit of doing that a lot of kids in high poverty don’t have. DGW: I think we might have touched on this the last time we talked, but it still concerns me, with all this focus on greatness, are we really preparing kids for life? We’re all not going to live “great” lives. We’re going to all have periods of “greatness” followed by periods of destitution. For the majority of us, we’ll be raising families and holding jobs. WT: Right. I want her to live her great. Whatever her great is. DGW: There’s a reason why this current generation is the most medicated, the most depressed generation on record. I think sometimes we don’t set people up to lead successful lives. We create the illusion that everything is going to be a YouTube video receiving thousands of likes. When it’s not, they aren’t equipped with the ability to accept that there’s a greatness in being able to care for your family and hold a job. That your greatest accomplishment may only be seen by those closest to you. WT: I think you’re describing grit. DGW: Touché. But, I’m also talking about compassion. Humility. Hard work. Resilience. Caring about others. WT: I do have to make one comment. What you said about Agassi and the Rocketship stuff – my only comment on that is that it could all be solved if the public charter schools that are serving MNPS students were allowed the same consideration in the capital improvement budget that everybody else is. I’m not saying that’s a lot of consideration because Tusculum, I know, waited a really long time for a new building. But if they were allowed to be a part of the capital improvements budget, I think that would solve some issues. DGW: It’s debatable. The last thing I want to touch on is the role the charters play in segregation. Many would argue that segregation takes place because our neighborhoods are segregated. I don’t know. I think one of the beauties of Nashville is that if you look at our demographics – 43% African American, 30% White, 23% Spanish, 4% Asian – we have a pretty good mix for an urban school district. But we end up with pockets that are very segregated, and there are people who would argue that charters, because of who they target, contribute to that segregation. And there are studies out there to back up that argument. How do you counter that? WT: I have been in quite a few high poverty district schools that are not diverse. They are serving high populations of African American students, and they’re not doing well. I would say that if you visit some charter schools, you will see that the diversity in many of them is a lot higher than you think. You can walk into Nashville Classical or East End Prep and find a much more diverse population than I think you have in your head. I haven’t looked at the numbers on paper lately, special-ed wise, you’ve got charter schools serving higher percentages than the district school, you’ve got charter schools serving about the same, and then you have a few that have less – none have less than the magnets. So I asked a mother about what she thought of the fact that her child was in a primarily African American school, and her first response was, “Our neighborhood school looked exactly the same.” Her second response was, “But this school’s going to get my kid to college.” I can’t speak for those families because I haven’t walked in their shoes, but I saw a whole lot of very non-diverse district schools in the city. I don’t think that has changed much. Your school is diverse. DGW: It is diverse but only to a certain degree. I got into an argument with Tim Drinkwine, former principal at Eakin Elementary, when he claimed that Eakin was more diverse than Tusculum. And then I realized that Eakin, due to where they’re located, has an economic diversity that Tusculum does not have. So the argument can still be made that Tusculum is still not as diverse as it could be. WT: I think the more important thing in my mind, and again, I do not pretend to speak for the African American community because I can’t, but in my mind, what I think is super important is that whatever the demographic of the students, are there high expectations, a great learning environment that is also a loving environment, adults in the building that build relationships with the kids and with the families, and the sense of community in the building? So I think if you have those things, especially the relationship pieces, well especially all of it, I don’t know that if you ask those parents that they will have concerns. Does that make any sense? DGW: But the most important thing is we had a little bit more of a conversation. We talked about things a little bit more. Each of us gave the other a little bit more to think about. I think at the end of the day, that’s important. I think that’s something we’re losing sight of. WT: I think that’s important, and I just want to say I think it is clear that you come from a very good place. We can disagree, but you and I have the same focus, which is what does education need to look like to best do what education needs to do? We don’t know the answers to any of those things, but I appreciate–I just appreciate that. Wendy and I headed to our separate cars, and I thought to myself well, she did a good job of keeping her horns and tail hidden. I also thought she was a funny, caring, intelligent individual who had given me even more to think about. These are the kinds of conversations that need to take place in order to ensure that we are providing our children with the best educational opportunities possible. I enjoyed reading this conversation and believe you both made real effort to “converse” share ideas, opinions and background stories. As a native of Tennessee and having both children go through public schools here in Nashville, I appreciate your effort to have discussion as you have presented here. God bless all you do. I wish that Ms. Tucker’s Project Renaissance organization would come out in support of the District-wide Transition Team Report. Privatizers were well-represented on the various teams. It seems like a natural fit, if indeed, Project Renaissance is about lifting “all schools” as implied in your interview. There are a lot of very nice, very well-meaning people in this discussion. This interview captures that well. … I visited the office, and spoke to Ms. Tucker, who graciously saw me without appointment. No one on team privatization ever takes time to define “quality”. They just point at MNPS – and wave a “Not quality” flag – as if everyone knows exactly what “quality” is, with no need for definition. It is infuriating. During my drop-in, she explained that their 16% claim was based on a multi-color report-card system that the MNPS Board and Administration was using to track progress across the district. Let me be clear. The “quality” definition of Wendy Tucker used to spread malice on her home page has zero to do with ACT scores, Common Core standards, or any other nationally recognized metric that helps us understand the performance of Nashville’s district vs. other large cities. It is beyond offensive that this most ridiculous of claims is still not clarified with an asterisk on their home page. It is beyond insulting that here we have a Williamson County Parent, completely insulated from the stresses of entrenched multi-generational poverty in the daily life of her own children, fighting hard to dismantle the integrated school down the road from my house. From the State Board of Education, she voted to install Great Hearts Charter in Nashville, but has voted to install no Charters *ZERO* in Williamson County. Williamson County legislators say, “We don’t need charters like Nashville does.” Oh really, why not? As chair of Project Renaissance, she has not provided complete accounting for the funding streams of the organization. In the absence of transparency, we can only assume that much of their influence is coming from the passionate radical edge of team privatization. Karl Dean, who has disavowed charter schools for his Governor campaign, somehow remains associated with her bizarre destruction-focused group. The privatizers argue that “competition” will improve outcomes for all students everywhere. Sadly, after 25 years of this stuff, that has not happened anywhere. The low scores of the ASD schools that Wendy Tucker supports has driven the final nail in the coffin of that debate. Education is the last place we should make decisions based on hype, personal anecdotes, and assertions that flame the court of public opinion, no matter how effective those things are in the private sector. As we frame public policy in the 21st century, we have more data than ever before in the history of the planet. We need to mine that data, as close to its source as we dare to go. And, we need to soberly confront the history of our city that has led to the structure of our system today. Fortunately, we may already be there…. I was very impressed by the composition of the MNPS Transition Team, the hard work of deep analysis that they performed, and the thoughtful list of specific action items to move all children forward across Nashville. Ms. Tucker, Is Project Renaissance on board? As a former business owner, I could not disagree more. The fundamental _structure_ of an organization is what survives, and allows it to thrive, as people come and go. Ravi Gupta is a genius. I had the pleasure of watching him in action during a Republic Charter board meeting. It was laser clear to that board, and to him, that it was the organizational structure of that school network, first and foremost, that fundamentally empowered its ability to attract donors, students, and expand into Mississippi. that purposively decided issues of resource allocation, marketing, strategy. In constrast to that boardroom, through 20 years of political decisions to make a few hundred people happy here or there, MNPS has become a labyrinth of endless twists and turns for parents to navigate. The competition, Williamson County, has one kind of school – zoned schools – serving all their kids, and families flock there in droves from choice-abundant Davidson County for middle school. Ms. Tucker included in the exodus. We can’t become as attractive to families as Williamson County overnight, for many historical and operational reasons. But the MNPS Transition Team report is the clearest instruction I’ve ever seen on how to dial back, if only a little, from the tangled mess we’ve made in Davidson County. I claimed that Ms. Tucker voted for Great Hearts, but friends reminded me that she was in fact NOT yet on the State Board at the time it approved the Great Hearts Charter application. I apologize for that misstatement, and I welcome correction to my main post. Ms. Tucker was the only “yes” vote against our local board in the matter of Rocketship’s denial. My characterization of her as deeply pro-charter still stands well. What’s not going to help is your repeated use of the word privatizers over and over again. Want productive conversations? Stop thinking everyone that likes choice is a privatizers. You demonize thousands of parents and teachers involved in choice. You mentioned that Wendy doesn’t know what it feels to be in Davidson co and see the poverty. Arent you in the richest area of MNPS? Please tell me how your experience in the Hillsboro cluster matches with the experience of someone in the Whites Creek cluster? I’m tired of the people who send their children to the public schools with hundreds of thousands in PTO funds so the school can make the public school feel like a private school. In the rest of the district, kids can’t read. Parents can’t make it to school meetings, to IEP meetings, and they are losing their jobs to go pick up their kids from school. We have schools that try to raise 50k to remove speed bumps while kids in North Nashville can barely fund interventions for their students. Get off your high horse and understand those differences. The plight of wealthy White liberals in our city drive the conversation away from the students of color who are failed every day because of MNPS.